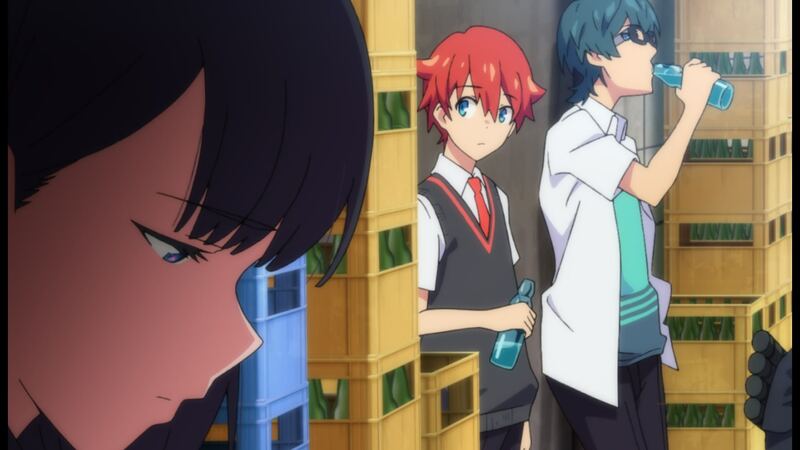 ─ I can see why SSSS.GRIDMAN feels like an unapproachable beast for some viewers, who were either preemptively scared away or are afraid like they won’t get the full experience. Gridman the Hyper Agent was originally a 1993 tokusatsu series, reimagined as Superhuman Samurai Syber Squad (the root of the four S in this title) for American audiences about a year later. This rather obscure title was brought back to life by TRIGGER-affiliated director Akira Amemiya with Denkou Choujin Gridman: boys invent great hero in 2015, as part of the Animator’s Expo program, reliving some of its key moments in animated form and even offering a glimpse into the future featuring plans for the original that had been scrapped. 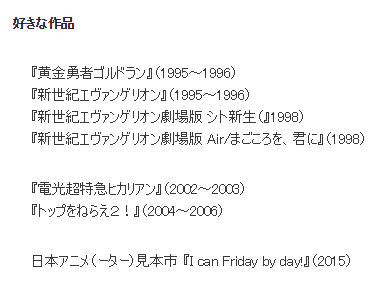 But it’s not tokusatsu history alone that it draws from: both animation and design work are full of references to iconic mecha properties from all around the world (Amemiya definitely wasn’t kidding when he called the animation a love letter to Masami Obari), while on a technical level the direction follows Hideaki Anno‘s rulebook to a T (as you’d expect from a director whose favorite series is Eva multiple times). 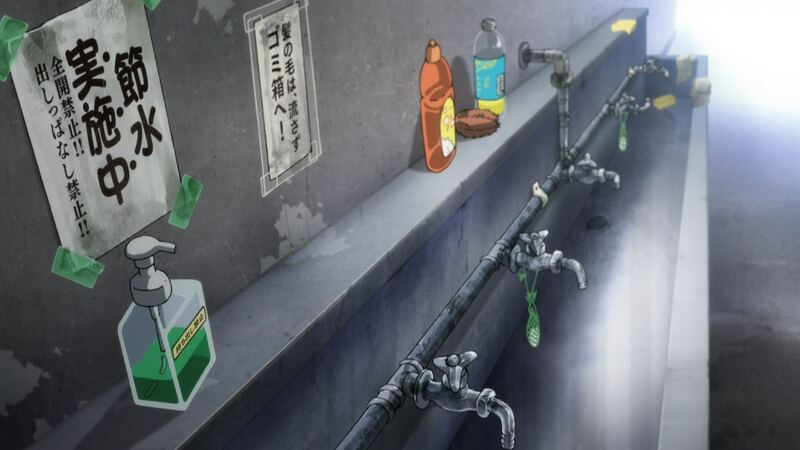 These disciplines are often interconnected, but the background in this case is denser than usual and has major effects over the show, so of course it could appear intimidating. ─ Should you pass on it if you don’t feel ready? Of course not! 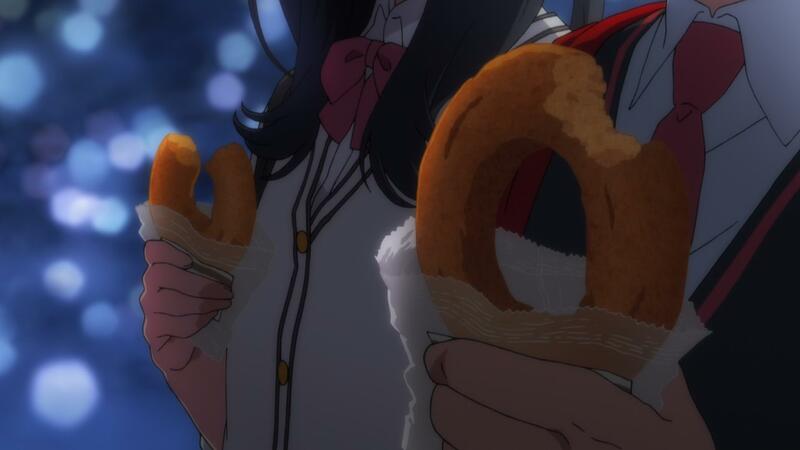 It’s true that there are narrative and thematic tidbits that you might find more interesting if you know the context, but SSSS.GRIDMAN is meant to stand on its own, and its appeal extends far beyond cheeky nods. The first episode is intriguing regardless of your knowledge of the franchise. The efficient script keeps the viewer guessing without overwhelming them, and the aforementioned Anno-inspired direction elevates the material even further. Seeing it click so perfectly is honestly no surprise, considering how big of a fan he is of both tokusatsu and kaiju titles, and how much those had influenced him in the first place – going full circle here! 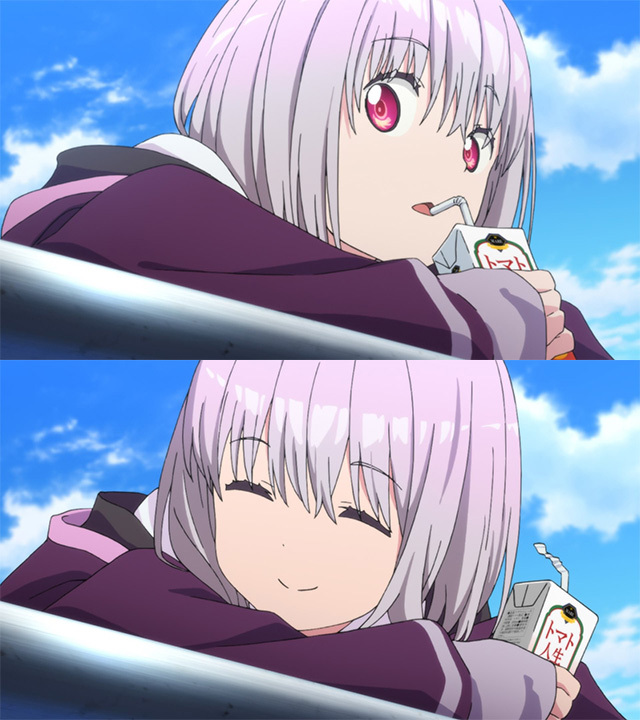 When thinking about Eva‘s premiere, the feeling of the summer heat comes to mind as vividly as any major events, and I’m glad I can say the same applies to SSSS.GRIDMAN #1; it’s cute how a younger ex-Gainax member like Amemiya picked up on Anno’s framing quirks (and outright used some of his recurring cuts), but I feel it’s much more important that he understood the reasoning behind those very sensorial establishing shots and was able to apply them to his own work. All things considered, the mysteries the first episode presents are compelling enough. 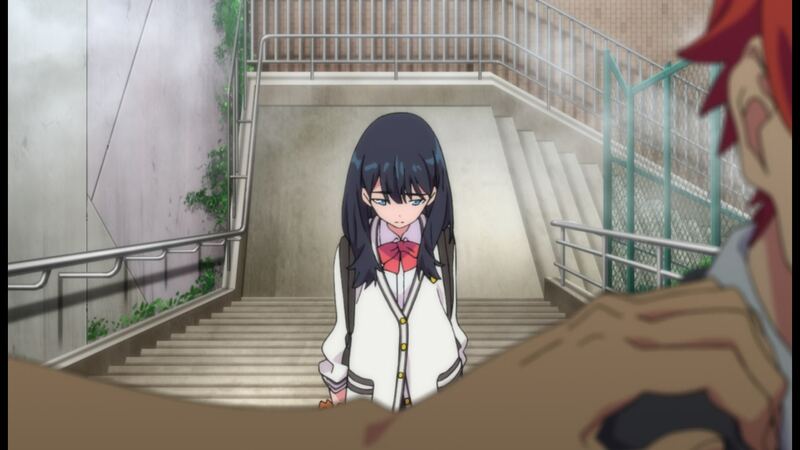 Rikka’s cryptic allusion to something that must have happened right before the start of the show makes a trope as trite as the protagonist’s memory loss already more intriguing, for one. But even if there wasn’t much of a narrative hook, Amemiya managed to create a world that’s interesting to simply experience. 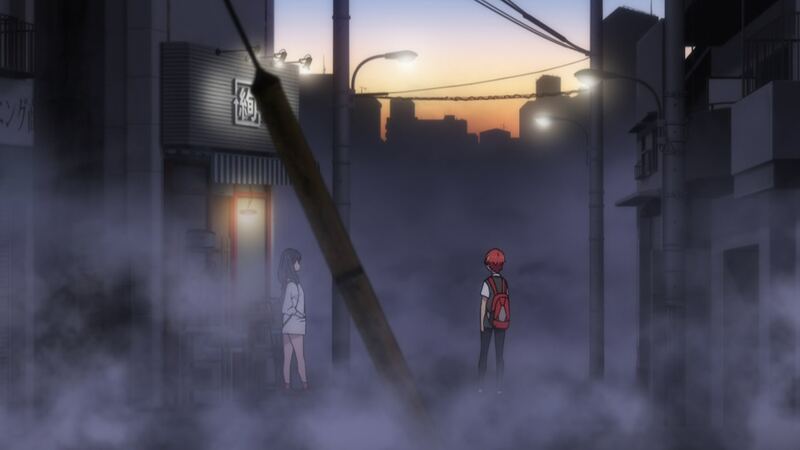 ─ Although it’s not a spectacular showcase of animation of the ilk that fans rave about, SSSS.GRIDMAN is still very ambitious production in some regards. 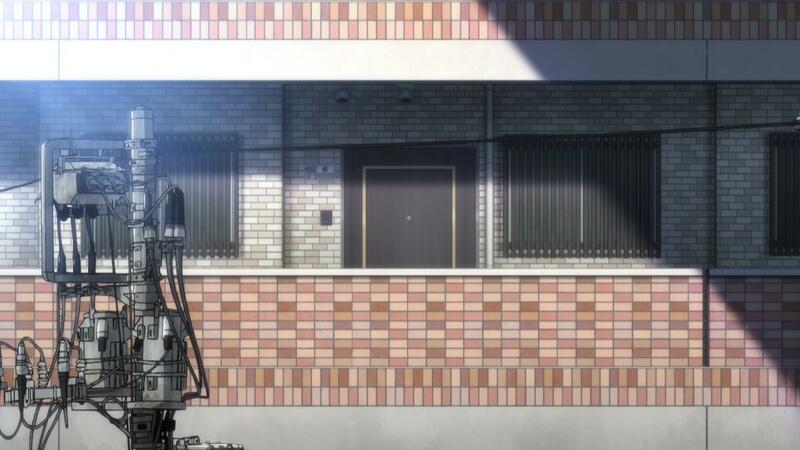 And there’s a particular aspect in which its quantitative excess has a very positive effect: the correlation between the amount of elements that are drawn and the show’s bewitching atmosphere. It’s not as if the show has a particularly high number of cuts (if anything it’s on the lower side because the Anno school of direction loves lingering gazes) but the percentage of the work drawn by the animation team as opposed to other departments is out of the ordinary, and that’s got a surprisingly tangible effect. 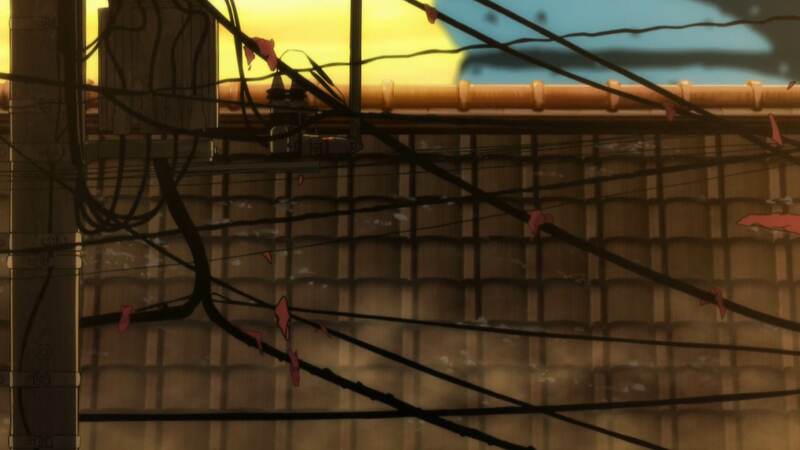 Chances are that you’ve encountered scenes in anime where you knew exactly which elements of the world a character would interact with, simply because objects drawn by animators and those painted by the background art team tend to have a very different feel to them. And since going through the art department is quicker and often more inexpensive than following the standard animation production line, static elements that aren’t interacted with are usually handled by the former. A minor detail by itself, but watch enough scenes where you know exactly which flower in an entire field will be the one that matters and the magic spell might shatter. ─ There are various angles you can tackle that problem from, especially as tech advances and allows options like using after effects to craft simple but believable movement for the background art elements. 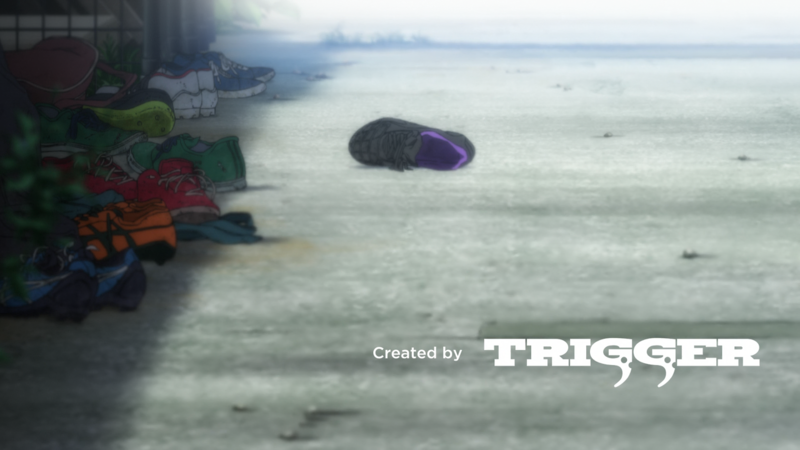 SSSS.GRIDMAN instead take the most straightforward route: to sustain the illusion that the characters inhabit the same world as the objects that surround them, they create them together in the first place. 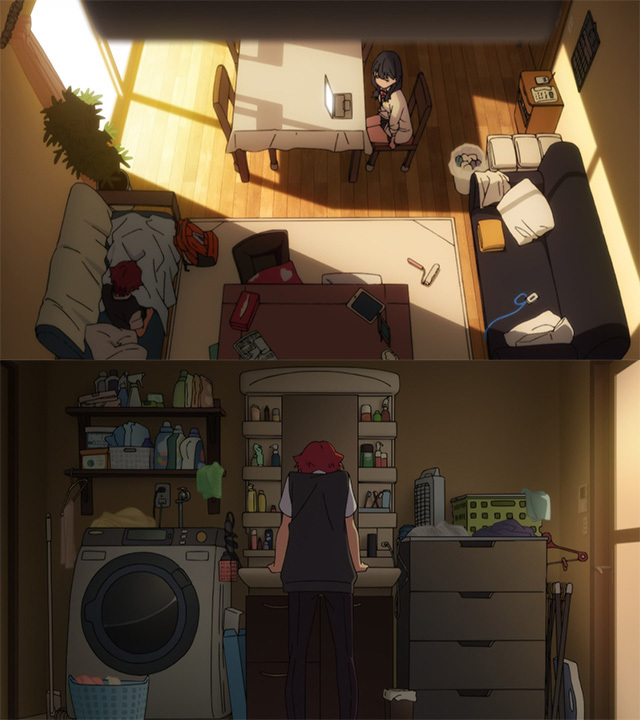 Rikka’s house feels much more lived in as thoroughly depicted by key animator Reo Itoyama (the person who got assigned the highest number of cuts in the first episode) than it would if it were just character art overlayered on sterile backgrounds. The same principle applies to the shop, which comes across as believably cluttered because of the great layouts populated by many tactile objects – as you can see in this scene animated by Yuho Onishi. 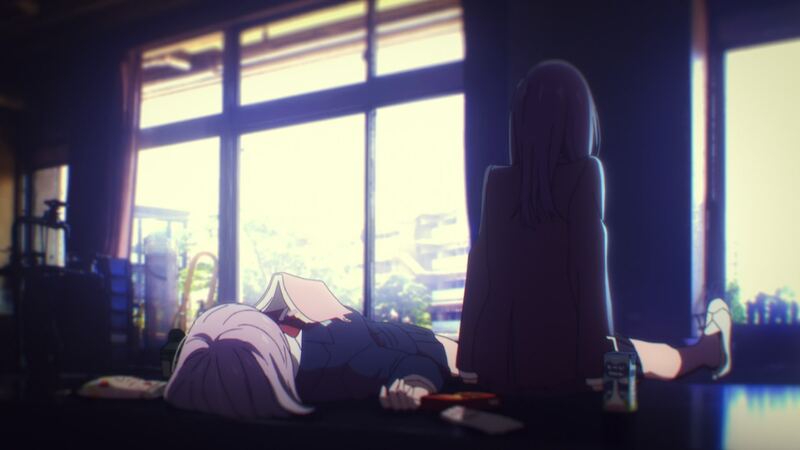 This illusion of a continuous cohesive world is strengthened by making even sequences with no characters whatsoever rest on the shoulders of the animation team; many of the interstitials and pillow shots with Anno flavor followed that, including some shots from Jiamei Deng‘s enchanting opening. 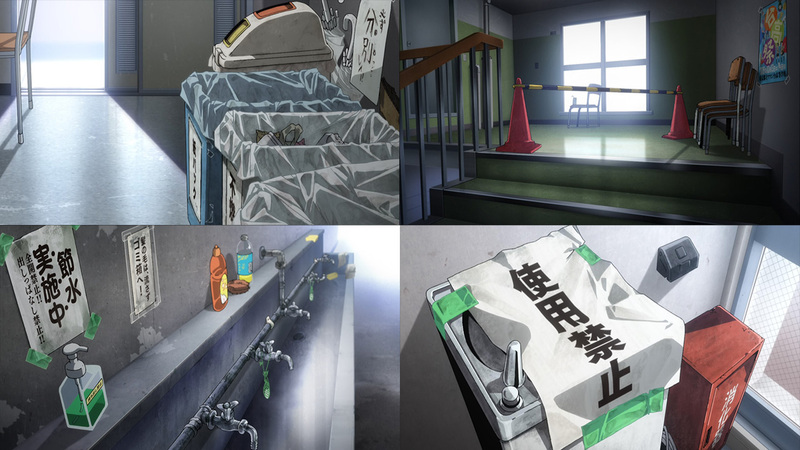 The most impressive snapshots from within the school come directly from the hand of director Amemiya himself, so you can tell how important this was deemed. They feel more authentic and cohesive in regards to everything else, while adding more texture to the already rich atmosphere. It’s a demanding approach, and obviously they can’t keep it up for every shot, but so far it’s been paying off. ─ As much as increasing the role that the animation team plays has been a key decision, I don’t mean to imply that the atmosphere is solely in the hands of the director and his animators. 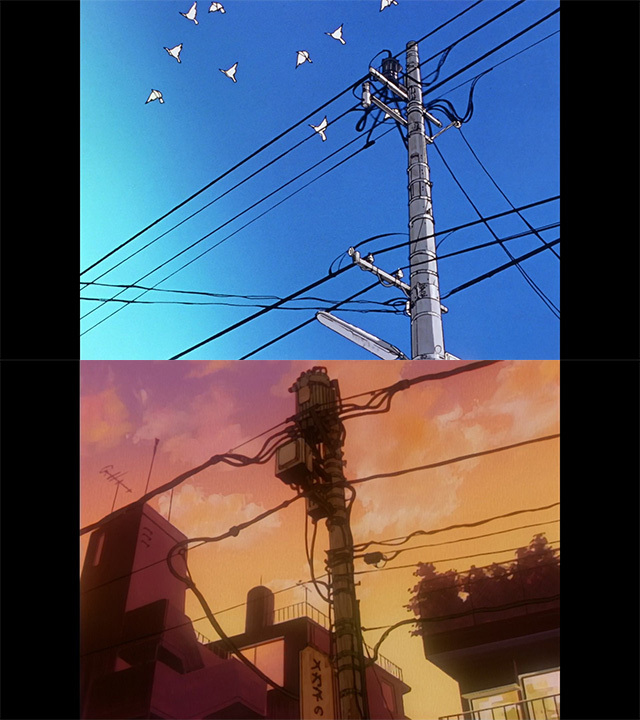 Anime is a collective effort, and as proof of that we’ve got another unexpectedly crucial ingredient to SSSS.GRIDMAN‘s allure: the telephone poles and power lines. No, really. This is something that was also omnipresent throughout Anno’s oeuvre and 90s anime as a whole, strengthening the specific nostalgic, sometimes unsettling vibe the show’s got going on. 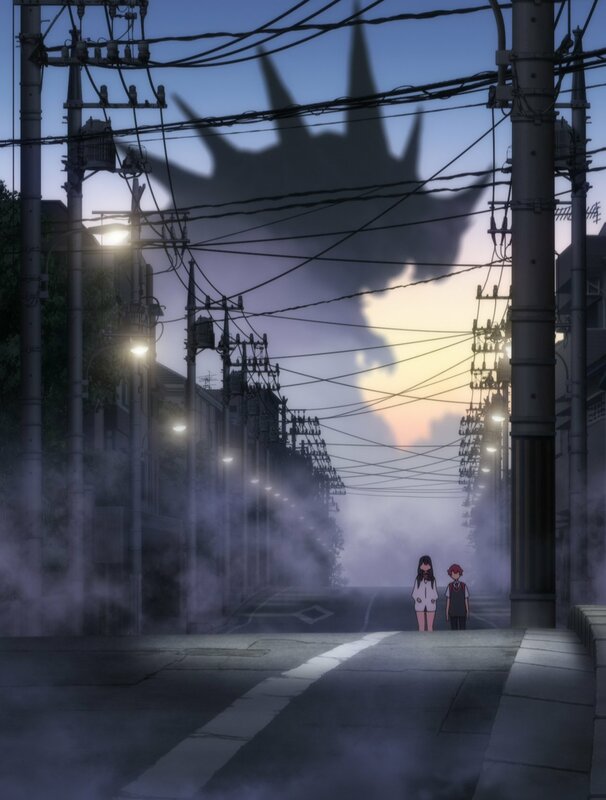 And besides contributing to the atmosphere, it also happens to be a perfect partner in crime for all the menacing kaiju imagery, often framing the monsters as if they were barely restrained through some truly memorable shots. This could have been achieved via the collaboration of Amemiya, episode director Yoshihiro Miyajima, Atelier Platz’s art team, and designer Tatsuya Tanaka, who’s specifically supervising this aspect. This show is very aware of its needs, curious as they may be sometimes. ─ Before we wrap up the coverage of the first episode, let me go through some of its most impressive sequences. 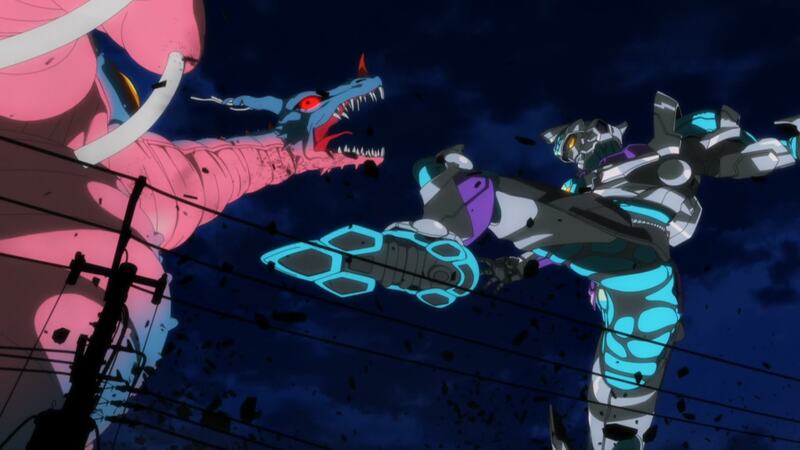 While I’ve noted that this isn’t your standard sakuga spectacle, that doesn’t mean it has no striking moments. Look no further than the extensive contributions by Yuto Kaneko, who knocked it out of the park when it comes to action and also the charming character work he’s known for. Kaneko also drew some bits of pieces of interesting earlier sequences, like this relay that features Michel Sugimoto‘s neat puppet-like shot and effects (the fact that the monster attacks with bouncing balls is something that becomes nastier once you watch the second episode), followed up by Kaneko’s reaction and finally Amemiya’s own explosion. Chikashi Kubota‘s guest appearance essentially to nerd out with a brief reference to The Brave Fighter of Sun Fighbird with fellow Obari fans like Amemiya and Heroic Animation Director Hiroki Mutaguchi is rather neat, but action-wise I’d like to highlight TRIGGER youngster Hiroki Arai, who handled about half of the hand-drawn parts of the fight, including some of its more impressive cuts. If you know me, though, chances are that you guessed my favorite animation excerpt was this cute and comfortable bit of physicality by Shiori Miyazaki. 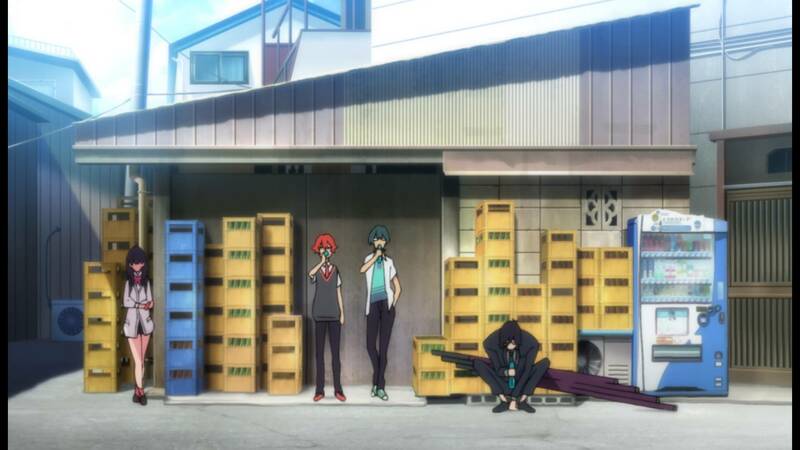 ─ The second episode arrives with another storyboard by series director Amemiya, overseen this time around by Masato Nakazono, meaning that there are no fundamental changes to all that good stuff seen in the first episode. What did change though, as impressions from private screenings indicated, is the standing of the main characters. After all, the affable parka-wearing classmate turned out to be quite the twisted villain. 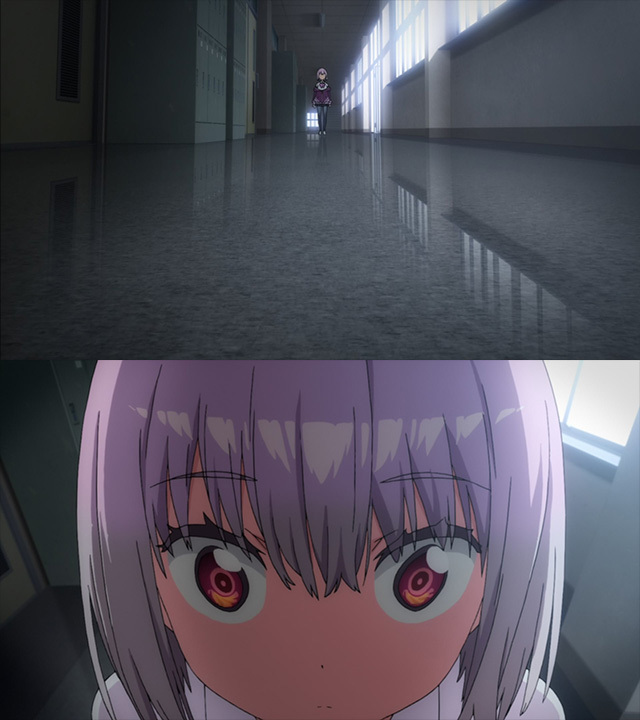 Unexpected for sure, but at the same time an extremely Gridman thing to do; Akane occupies the same place (literally) as Takeshi from the original series, by creating monsters for a menacing digital entity who controls them… except with much higher stakes, as the battles no longer occur in the digital world and the consequences are already deadlier. Takeshi’s charm came from his petty anger and often silly targets of his ire, ranging from kids playing with r/c cars to tap water, which Akane seems to have mixed with joyful ruthlessness. The way this was revealed is worthy of note too: by showing the second incident in its full, you’re quickly able to deduce the reasoning behind what occurred in the first episode and even the means of execution, which is quite the satisfying little moment. ─ As I mentioned it’s not just the writing that stayed graceful, Amemiya’s storyboards are on-point once again. He’s shown to be quite attentive when he wants, paying attention to the sillier visual gags he’s more known for but also when it comes to more personal and understated details; as someone who also tends to subconsciously take out frustration on straws, this was quite the relatable tidbit. The contrast between the portrayal of both girls in this episode is quite interesting. 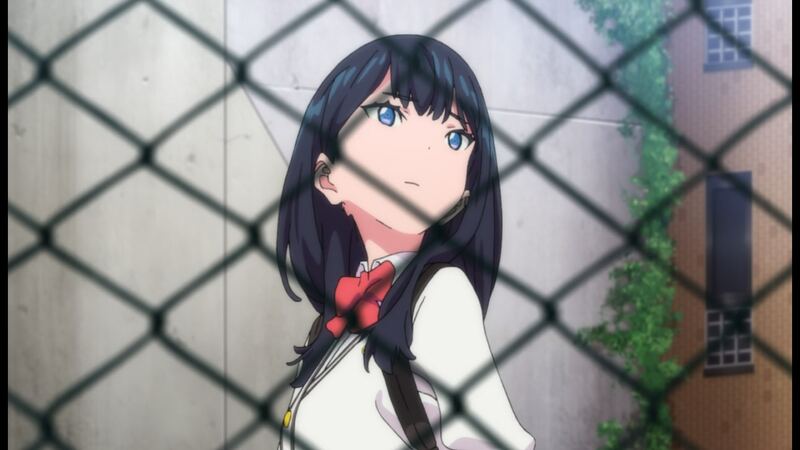 Whereas Akane gets the most conspicuous, eye-catching shots to highlight her instability and make her appear threatening, Rikka’s depiction is similarly deliberate yet much less flashy. She’s constantly apart from the other two members of the team, often in the dark or with barriers built between them. 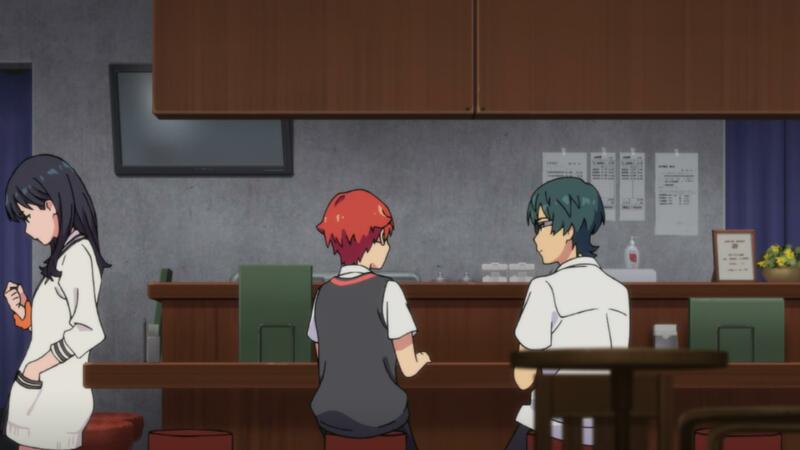 Yuta is the hero and Utsumi’s an expert on the genre that’s somehow come to life, while she’s mostly just worried that she might lose another friend, unable to even encourage Gridman to fight because she realizes how dangerous this whole ordeal is. 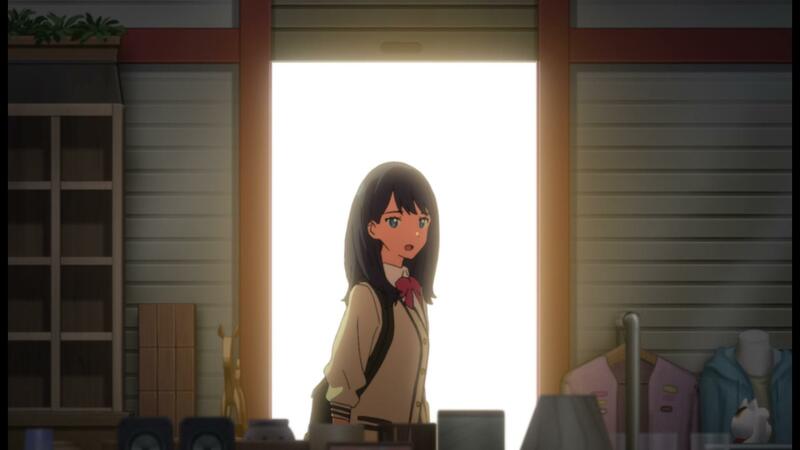 But once her resolve has steeled, we see Rikka standing in front of a radiant door for once. There’s no doubt that she’ll play an important active role now. This scene by Michel Sugimoto is perhaps the most impressive sequence in the second episode, especially the tense excerpt of background animation. ─ After that stunning first episode, I’d argue that the production lost some of its luster, but not to a worrying degree by any stretch. 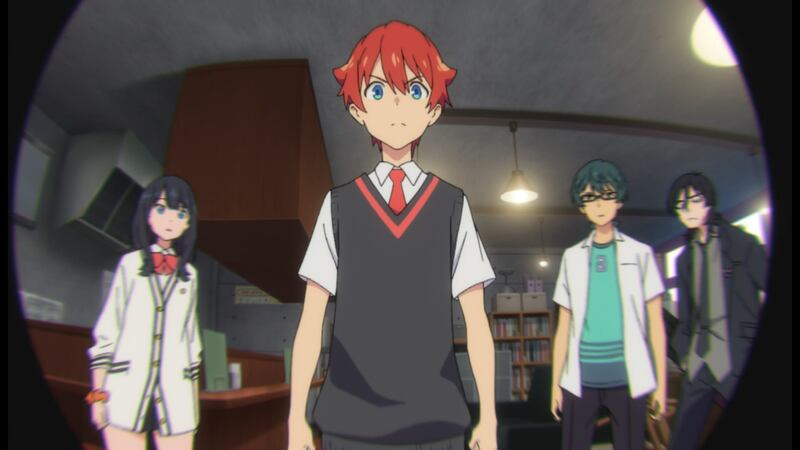 For starters, nothing is going to stop the resident mecha nerds from having a lot of fun making this show; Gridman’s flamboyant entrance, animated by Toshiyuki Sato, is a direct reference to a sequence in the first Dangaioh that Amemiya and Mutaguchi once again requested themselves. Their ability to combine those wild Obari-school cuts and imagery with smoother CGi duels where the excitement comes from the choreography and involved camerawork shows how well the staff as a whole understand the appeal of the genre. 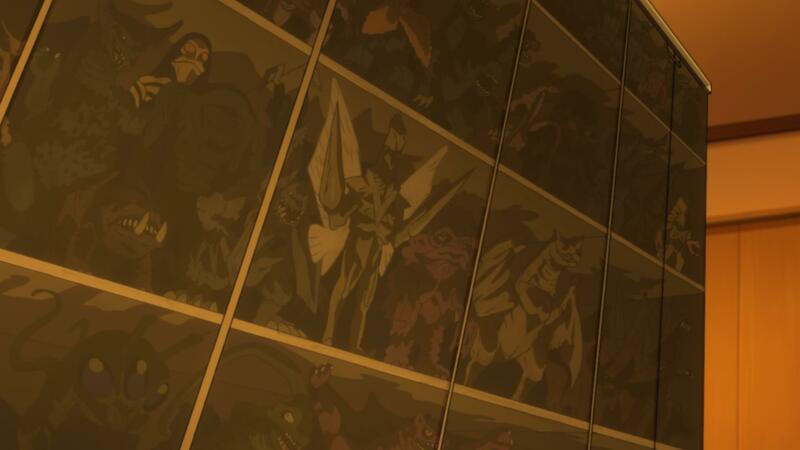 And yes, the 3DCG work is arguably uneven in the sense that it peaks high yet feels underwhelming here and there, but I’ve got to say that I grew fonder of it once I realized that the monsters’ silliness is intentionally emulating the wonky live-action suits. This second episode also established an interesting mutually beneficial relationship between digital key animator Yusuke Kawakami, who got to practice acting sequences he found troublesome, and the supervisors, who found his usage of three-dimensional layouts made in Blender very interesting and would love to learn more from him. Fan-favorite Kai Ikarashi made a brief appearance before going on to oversee the next episode, so look forward to more of that soon. ─ Since both opening and ending made their debut on this second episode, let’s put an end to this already way too long post with a quick mention of those. 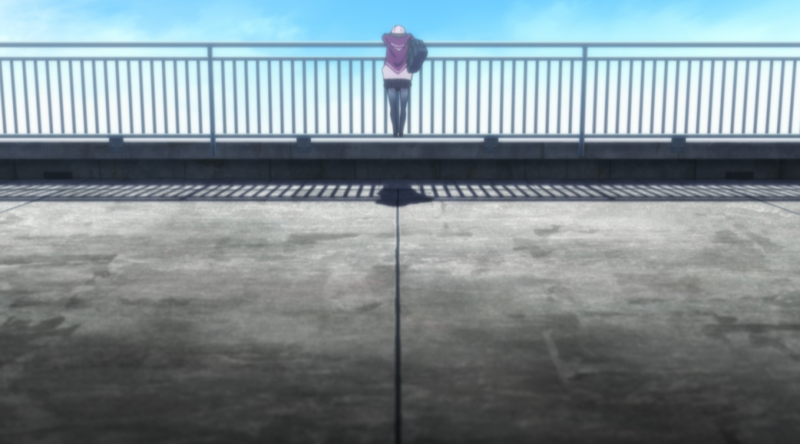 I don’t have much to say about the opening, since Amemiya’s direction there essentially encapsulates what I’ve been talking about all along, but the ending sequence by Mayumi Nakamura was a very sweet surprise. 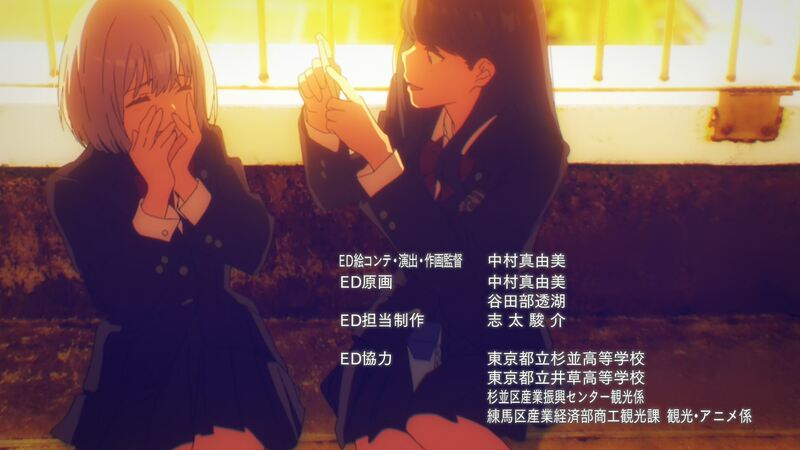 More than anything else, I’m impressed by how clear her ideas were on her very first sequence: the whole ending focuses on Rikka and Akane, appearing over footage of a real school and postprocessed in a way that’s meant to emulate stock photo filters since as it turns out, this is just them snapping shots together. The result is aesthetically pleasing for the most part, but even the shots that honestly feel overdone make sense once you see the overall intent, as do the crude photorealistic backgrounds. 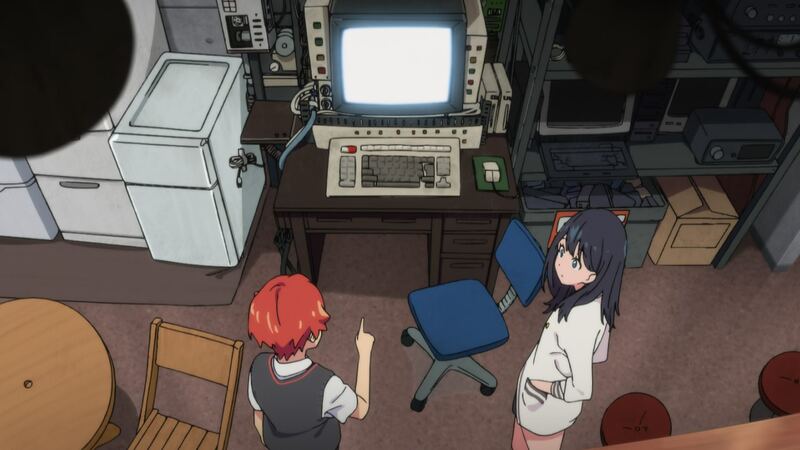 Besides storyboarding and directing it, Nakamura also key animated it… alongside Khara-trained prodigy Touko Yatabe, who actually used to be one of her classmates. Makes the whole sequence work on another level! Since episode 3 has conte by Geso Ikuo (!) I’m really interested in what he does with it. The rainy shots that we’ve seen in PVs and preview pictures look very effectively moody. He’s handling the storyboard for 3 and then 4 appears to be fully outsourced to his own company, so a lot of geso content is coming up. I cant get enough of Sakamoto’s designs, their the reason i watch the show and the references of course since i never really got into Ultraman or something similar. It’s being a new experience for me and i’m liking it until now. Sorry for offtopic, but do you by any chance know whether Haifuri movie’s been finished before bankruptcy declaration or not? The production wasn’t on their hands anyway, IMS had been inoperative for many months already and certain sites simply failed to notice. They’d been closed for all of 2018.
hi kvin,I’ve read your articles for a long time,and can I translate them into Chinese and upload to the Chinese website? people really like it,thanks for your effect! Glad you enjoyed it so that I’m not responsible for wasted time, lol. I put emphasis on how the show is actually very accessible in spite of the countless winks because it genuinely works both as an assorted nostalgia bomb and a plainly enjoyable fresh experience. Also that’s a yuusha pose! It’s basically transcended its origin but with people like Mutaguchi and Amemiya moments like that are genuine references to the original franchise. hey, you also happen to be pretty much singlehandedly responsible for me gross crying over kids’ anime this year (as well as trying other shows like koiame that i otherwise might never have gone near but wound up really enjoying), so i have a reasonable amount of faith in your taste lol! 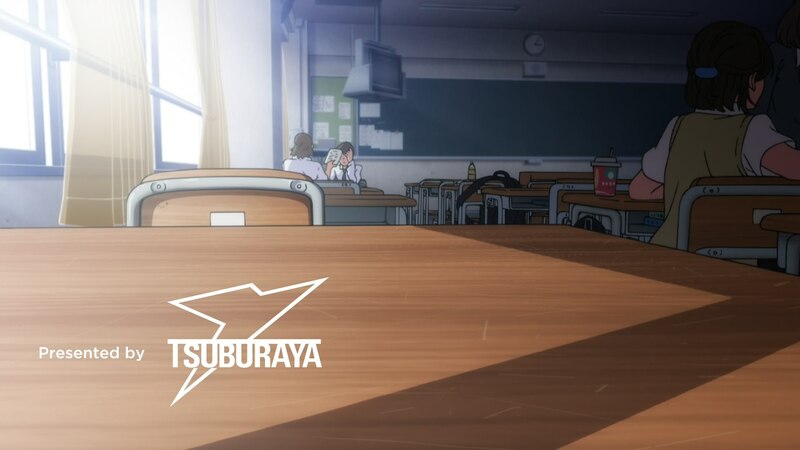 I often laugh hard wacthing this show because of how similar the directing is from Evangelion. 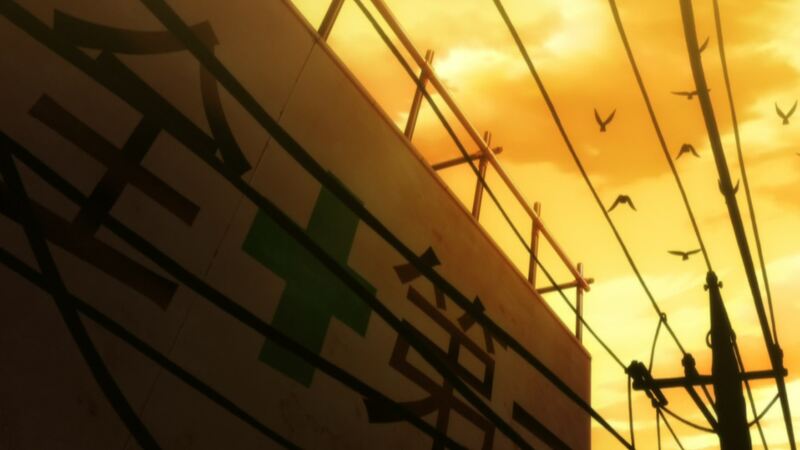 The firts time I watched I was: “that… feels like Evangelion”, and then I looked at its Wikipedia articles, and sure enough, some of the guys doing this also worked on Evangelion. 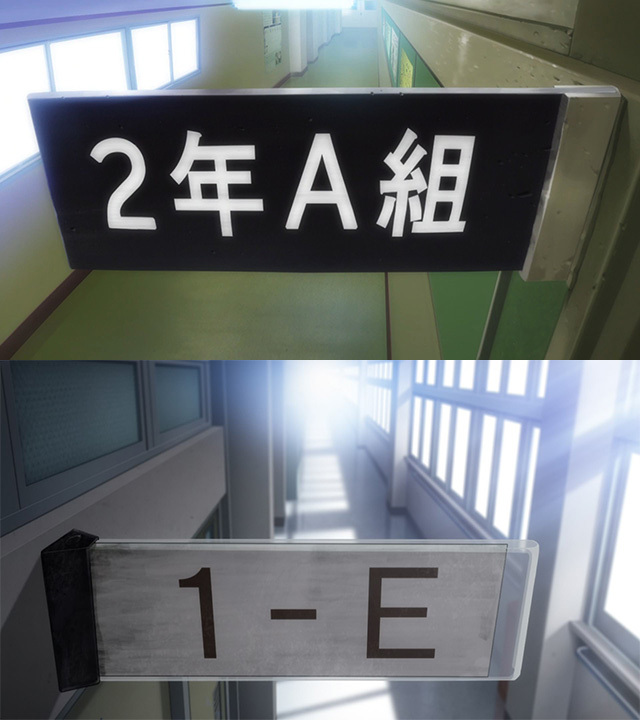 Some scenes are pretty much the same scenes we saw in Evangelion. Not a bad thing, by the way.